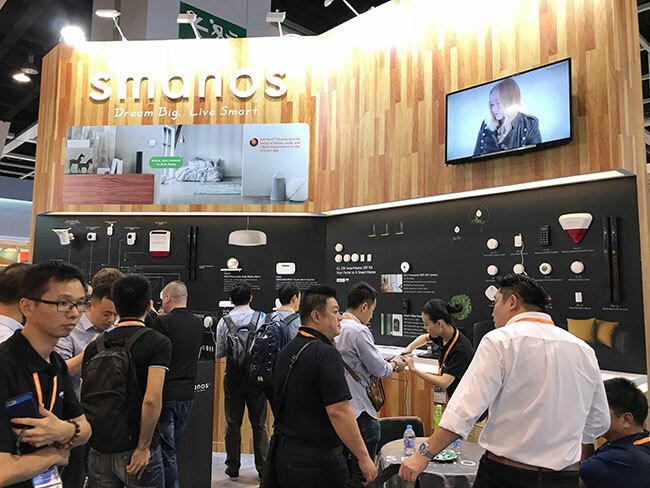 Hong Kong – Oct13, 2017 –smanos, a trendsetting innovator and dynamic developer of wireless smart home and DIY security systems, is thrilled to be backatElectronics Fair in Hong Kong again from October 13~16, and isproudly showcasing its latestsmart home solution portfolio. From WiFi, cellular, app-enabled alarm and video systems to remote security and energy management, smanos solutions cater to today’s mobile-driven lifestyles and ever-evolving residential needs, and ensure property owners and their family members have complete control, comfort and visual confirmation right at their fingertips within a few short minutes and easy swipes and taps. 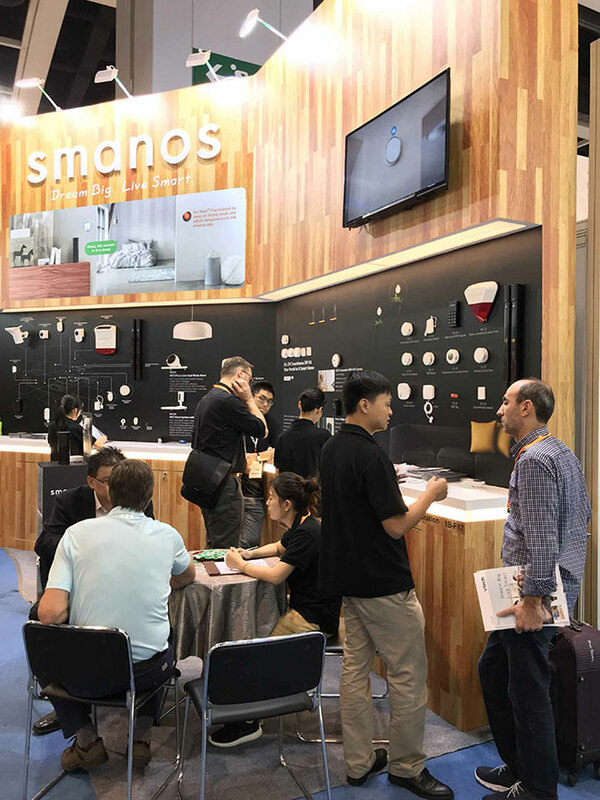 The complete smanos smart home portfolio speaks minimalistic elegance, self-installation and self-monitoring, and is available at1B-F17atWanchai Convention Centrethroughout the 4 days. The K1, the ultimate home automation and security center, is smanos’s smart home gateway, combining butler- and guard-like functions into a stack of esthetically pleasing round discs. Up to 50 wirelessly connected devices, including sensors and cameras, can be intuitively operated as part of the system, either locally on-site or via an iOS or Android mobile device. “We have added a few cool features to the K1 smart home hub so that it is compatible with the Nest? thermostat and Amazon? Echo,” said Hayden Hsu, SVP Strategy & Marketing. 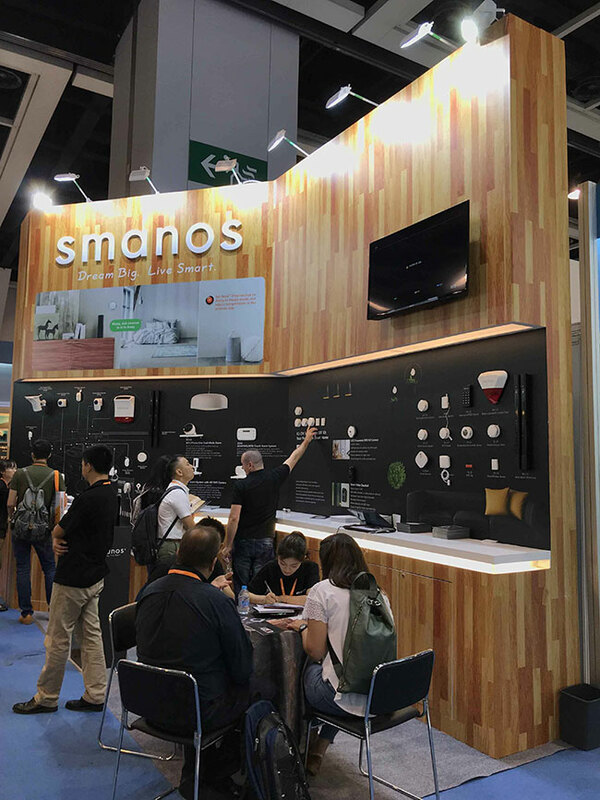 “With smanos’s intuitive operation and user-adjustable scalability, your smart and connected home has just become that much more adorable and affordable with the K1.” The newly enhanced, Red Dot, Computex and DISTREE award-winning K1 kit is globally available at an MSRP of US$299.99. Available separately or as part of the K1 system, smanos’s UFO Panoramic WiFi HD Camera brings clarity, immersive vision and ease of use to home monitoring, through its surveillance-grade HD fisheye lens, superior night vision and accurate motion detection technology. The smanos UFO camera can be mounted on the ceiling or anyflat surface, and provides six selectable viewing angles for all possible monitoring needs, directly on your iOS or Android smartphone. The footage is stored on-site (via an optional microSD? memory card) and soon can be accessed, shared and archived remotely via the cloud. The smanos UFO Panoramic WiFi HD Camera is globally availableas well, at an MSRP of US$179.99. 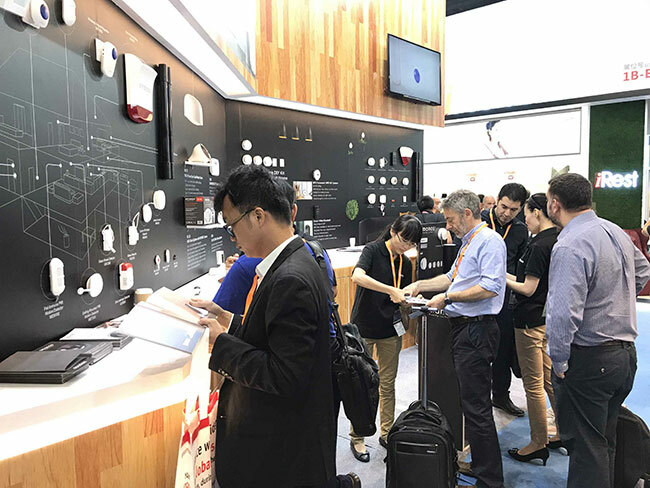 As a proud winner of COMPUTEX d&i and TWICE VIP Awards, smanos’s new Smart Video Doorbell empowers you to answer the door even when you’re not home! The doorbell captures and sends real-time video and audio to the homeowner’s and their family members’ smartphones. With the iOS or Android app, users can speak with the visitor – or potential intruder – from anywhere in the world as long as their mobile device is online. The doorbell features simple DIY installation, is AC-powered (with backup batteries for usage around 10 hours), and works independently or with the smanos K1 to connect to other wireless sensors as your dwelling’s requirements evolve. The smanos Smart Video Doorbell will be available globally in Q4 2017 at an MSRP of US$199.99. Designed in the Netherlands and marketed worldwide, smanos is our complete security, monitoring and automation system lineup for today’s homeowners, said Oliver Tseng, Sales Director for Europe. “What makes smanos a must-have brand to distributors, retailers and operators is that we’re truly committed to researching, designing and delivering innovative, comprehensive and easy-to-use smart home solutions that will help them outperform their sales and profit targets.” Worldwide, what’s being demanded in the residential market these days is smart, simple, sleek, mobile yet compact and integrated ingenuity, and smanos will continue providing just that, with even more home automation, cloud-based management and monitoring options.